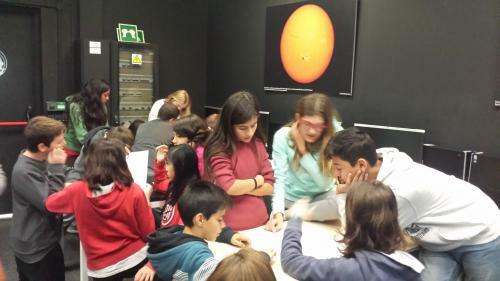 On the 29th of November, 56 students in their first year of ESO from IES Las Rozas I, came together with their teachers to ESAC to be scientist for a day. The research topic selected by them was "The study of the Sun rotation"
After a warmed welcome from the CESAR Team, who answered the key questions for their teachers, they started to work. For that the students were divided into two groups. The first group made a tour around the ESA space models at ESAC, stopping at each one of them for explaining the different space missions. The second group was divided into smaller teams to perform their research. Each member of the team had a key role within the team but all of them were essential. During all the process STEM techniques were applied and the information was shared within the team. At the end of their investigation each team presented their results to the "scientific community". 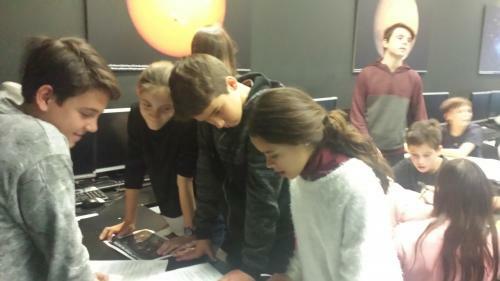 Once each of the groups finished their tasks, they went to make the tour around the space models and viceversa. There was a great morning of scientific and engineering learning for all those that participated in it.